Giocosolutions has developed, patented and produces the latest generation offlexible photovoltaic panels , realized with the”G Wire“, innovative technology, made of particular technopolymers that give them an higher efficiency and aweight of about 1/8 in comparison to the traditional glass panels. Rolasolar is an Australian distributor of Gioco Solutions semi flexible Solar panels. Any size model in the range can be ordered with a 14 day lead time and refer individual products for size held in stock Brisbane Australia. The specific methodology of contactation, combined with the use of photovoltaic cells of latest generation with a superior efficiency to 21%, has allowed to realize photovoltaic panels with levels of productivity among the most elevated in the world. These features make flexible photovoltaic panel particularly suitable to be applied to different environments, such as boats, marine applications, camping cars, shelters, biouvacs and in general for all the Stand Alone and Off Gridapplications, included also the On Grid applications, for architectural integrations. 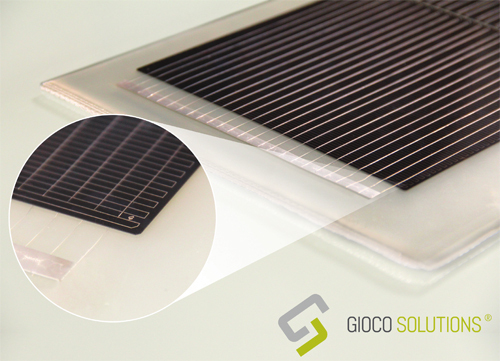 GiocoSolutions developed a type of flexible photovoltaic panel realized with the innovative GWire technology,this technology that prevents “micro-cracks” and “hot spots” by increasing the number of wires in the cell. Thespecific methodology of contactation, combined with the use of monocrystalline cells with a superior efficiency to 21%, has allowed to realize photovoltaic panels with levels of productivity among the most elevated in the world. Check out the Gioco Solutions mono crystalline solar panel range, click HERE or on the photo.